As you can imagine, perpetual calendar mechanisms are extremely complex and difficult to engineer, especially when other complications are involved. In fact, no company had combined a perpetual calendar and chronograph mechanism in the same watch until IWC accomplished this with their Da Vinci Perpetual Calendar at the Basel show in 1985. That watch proved so important that it has remained in the IWC product lineup ever since. This accomplishment is credited to the great watchmaker, Kurt Klaus. Having started with IWC in 1956 and honing his craft under the legendary Technical Director Albert Pellaton, Klaus labored for four years, designing the perpetual calendar mechanism in his head and on paper. The result has been lauded as a work of genius for its simplicity and form. Today, Klaus serves as an elder statesman of watchmaking, inspiring enthusiasts like me with his craft. In 2007, IWC honored Kurt Klaus with a special edition Da Vinci Perpetual Calendar model. Limited to 1,000 in red gold and 3,000 in steel, the IWC Da Vinci Perpetual Calendar Edition Kurt Klaus is a spectacular watch and a tremendous value at $36,400 or $24,000 list price. But this is Grail Watch, so I set out to find a more affordable alternative. Motion in Time, a New York grey-market seller, offers both the gold and steel versions of the IWC Da Vinci Perpetual Calendar Edition Kurt Klaus, new but at a substantial discount. They are asking $29,500 for the gold and $19,500 for the steel version. I prefer the looks of the white face steel version, but the more-limited edition in gold might be the better buy. Although I have no experience with Lombard Perspectiva of Moscow, they currently have the gold edition for an even lower price, 1,290,290 Rubles (about $17,000), used with box and papers. Their site shows only generic photos however, which gives me pause. Although there are some great deals in second-hand luxury watches from Russia thanks to their falling economic prospects and currency, there’s always risk in buying from an unknown shop. Although they list this watch on Chrono24, they don’t offer that site’s secure payment option, which gives me pause. Another option is “Wonder Invest” of Warsaw, Poland. 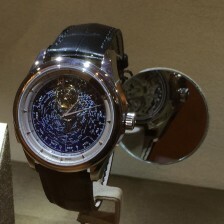 They currently have a gold IWC Da Vinci Perpetual Calendar Edition Kurt Klaus listed on Chrono24 for $18,500. I feel better about their offering since they have actual photos of the piece, but of course I have no experience with them either. Since they offer the Chrono24 secure payment option, I’m much more confident in this transaction.